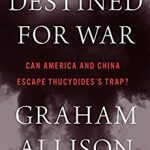 This is a rolling book review of Destined for War: Can America and China Escape Thucydides Trap? By Graham Allison. I’m half through the book. It is worth your time. Here’s why. This book is being read by the upper White House staff. Sure, you might not be a Trump fan, but still you need to know what people like Bannon, McMaster, and Mattis are thinking. They will be making the case for whatever Trump eventually does. Tensions are escalating between the US and China because of the North Korea missile tests that seems to be getting more sophisticated. The book’s premise relies on Thucydides Trap which goes back to ancient Greece when Athens and Sparta battled it out and, in the long run, destroyed each other. The theory is this: the standing power (in this case the US) is challenged by an upcoming power (China) and normally that leads to war. Graham Allison makes a good case through history. More times than not, war happens, as in 1914 at the start of World War I as Germany (an upcoming power) was trying to challenge Britain (a standing power). But it doesn’t always happen; look at the Soviet Union and the US during the Cold War which never saw a direct battle between the two enemies. So, although he is making the case that war can be avoided, Allison paints a more militaristic and totalitarian picture of China and its leader Xi Jinping. Xi now has total control of The Party, bureaucracy, and the military. He has removed or jailed anyone within the party and in the military command who is not loyal to him. He is one of the most powerful populists in the world who has consolidated power from within. The openness of western democracy resembles a house of glass as Russia and China could undermine us militarily and economically. The Chinese military buildup and its technology are gaining quickly that could be more advanced than the US within the next few years on the sea, in the air and cyber space. China is building a high tech infrastructure called the Silk Road that will connect Asia with Europe so Europe will become more reliant on China and not the US. War between the US and China will be a battle over culture. Both countries have a superiority complex. The US is all about freedom; while China is about order. We put checks and balances on power, China finds efficiency in the order of government. The Chinese are more tribal than the US. America accepts immigrants (to a point now) while you can’t be a Chinese citizens unless you were born there. China look at things in decades. The US looks of things in 2-4 year cycles. China believes the economic order now is controlled by the US under rules after WWII. The Chinese are now a player and they want the rules changed to reflect that. Having US battleships patrolling Chinese waters is not an option. The Chinese want to win without firing a shot. They still believe in Sun Tzu The Art of War that avoids war by creating more allies. Neither China nor the US want war. Both sides know the nuclear consequences. However, circumstances beyond the control of both sides could spark war. In 1914 it was the assassination of Arch Duke Ferdinand. In 2017 we worry it could be North Korea. Again, this is a rolling book review. But my recent theories on China are being questioned or leaning in some other directions. Where’s it moving? I had come to rely on a less bellicose China based on my research. China, I had thought, doesn’t want war. They are more concerned about creating an economy to keep billions of Chinese happy and not revolting. Those same Chinese citizens endured the one child policy and wouldn’t want to sacrifice their one child for the political goals of the Chinese Communist Party. Do I see China differently now based on the book and seen through the prism of what is happening lately? First, North Korea and Kim Jong-Un are not being chastised, at least not publicly, by Xi and China for the recent missile tests. There are reports that Chinese technology is helping North Korea’s missile efforts. This seems to undercut the theory that China has to worry about North Korea failing after a US attack on North Korea which would lead to massive war, a ruined Asian economy, and millions of refugees pouring into China. Is China merely using North Korea as a bargaining chip to keep status quo? It makes no sense. The US is feeling eminent war as each incident happens. There is no way the US – moderates and liberals included – will sit back and allow it. Maybe, just maybe, China wants a war to have control of the region while damaging the South Korean economy. Second, when we see China moving aggressively into Africa, Australia, and South America to lay claim to natural resources, is this an act of war or keeping a populace happy and content? Still, there are so many pitfalls for China. We will see. Read along if you can. And offer your take. Previous post: CNN, All Media: The New Russia?